Note: While this review will be spoiler free it will make reference to previous books. If you haven’t started this series yet (and you really should! ), check out VBC’s review of book 1, Written in Red. War is brewing. The Humans First and Last movement have struck the first blow by attacking the Others but what they don’t realize is their fate lies in the hands of far older beings. The Elders, Thaisia’s teeth and claws, are coming and Simon Wolfgard, along with the rest of the Lakeside courtyard and their new human pack, will have to decide just how much human will the terra indigene keep? Four books in and these books just keep delivering. Anne Bishop gives us glimpses of the world beyond Thaisia, and I love how she weaves in new characters, making them feel like an integral part of the whole despite being introduced so late in the series. We’re taken out of Lakeside for good chunks of the story, and seeing how the Others are adapting to their new human allies adds more depth and detail to an already intricate world. As a Meg and Simon ‘shipper, I love how their relationship is developing. It’s sweet and slow, but it works for them. To go any faster would feel…wrong. And it’s not just the romantic angle that makes me want to squee (but c’mon, let’s be honest, that’s what we’re all squee-ing over). Simon in particular struggles with how to proceed with Meg, because he understands just how much of an impact he has on the Others as a whole. He has to decide how much of a friend (or more) he can be and still be a Wolf. But with all the new parts comes new points of view, and at times that was to the detriment of the story. Switching from terra indigene thinking to human thinking to Meg thinking made it harder to follow. Sometimes I felt I was missing out on something, and others I wanted to stay in Lakeside, rather than jump to the Sweetwater or Prairie Gold. None of that really matters though. I finished the book and immediately wished I hadn’t, because that means I have to go a whole year before the next one. Vision in Silver gave readers the foreboding warning of those other Others. The ones that go bump in the night, which we don’t necessarily see, but their presence makes the hairs on the back of your neck raise. I have to give Anne Bishop major kudos for keeping an air of mystery surrounding these creepy Others, yet still giving us a complete understanding of what they are capable of—If not exactly what they are. Marked in Flesh I think ventured the most outside of Lakeside, and our original cast of characters, that we’ve seen in the series yet. While I’m the type of person who typically loves the core group of characters that start a series out, here I found myself really drawn in with the new(er) characters, and surprisingly, when they get caught up in the bad, I felt it just as much as I would if Meg or Simon (or Sam!) was caught up in the bad. Trust me, there’s plenty of these moments as the story leads to the inevitable climatic moments. One of the things I really liked about Marked was getting to see steps taken to give the cassandra sangue other options for speaking prophecy besides cutting. We’ve already seen this with Hope and her drawings, but not everyone will have that same outlet. Meg’s cutting has always been this ominous cloud hanging over the series. When all is said and done, I’m interested to see how Anne Bishop concludes this storyline in particular. One last thing, because I have to mention it, Simon and Meg…..Still. So. Sweet! 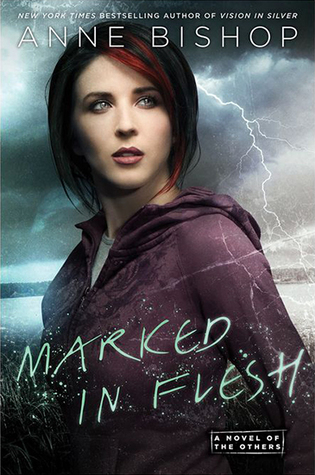 Marked in Flesh is kind of like a disaster movie: predictions of catastrophe, followed by several smaller, isolated incidents, then finally the big earthquake, flood or alien invasion that everyone’s been trying to prevent. And the whole time the main characters are watching, analyzing, communicating, but not directly involved in the action. I’m not saying that’s a bad thing. But it’s unusual for urban fantasy, and a little bit different than the rest of the books in The Others series where the heroes get to battle the villains with teeth and claws. I was completely sucked in by the escalating tensions and the political intrigue. I would have stayed up all night reading if my iPad battery hadn’t died. The Elders, the Others who live in the wild places and are rarely seen, have tasked Simon with deciding how much “human” should remain in the world after humanity broke the agreement allowing them to use the land. He’s also become responsible for protecting some of the humans, the cassandra sanguine and the residents of the Courtyard, so watching him try reconcile the two was interesting to me. But the Others are all business in this book, with the exception of a few Meg and Simon scenes which I loved. I liked watching Meg build the deck of prophesy cards and try to determine what tools others girls might need to communicate their visions, but there just aren’t as many “slice of life” moments as usual. And I missed those. Wow, things happen people. Things. Happen. This was a heady mix of calm-before-the-storm tension and smack-you-in-the-face action that made for some tense reading (in an awesome way). One thing I adore above all else in this series is Anne Bishop’s commitment to this parallel world: the language, the multifaceted setting, the combination of subtle similarities and vast differences to our own. The detail is just staggering. The downside is it can get a little overwhelming at times, especially with the amount of subtext in this installment; I had to read really carefully at times. There’s a great injection of new characters here (love Momma Montgomery), which helped to show the far reaching the consequences of the HFL actions in Visions in Silver. I was surprised just how much I cared about these characters in such a short amount of time. I also loved that we saw humans outside of lakeside that are just as against the HFL movement. These new settings didn’t take away from the original of Lakeside though, with dynamics that continue to be fascinating. I did wish there was more Meg and Simon times, but what can I say–I’m greedy like that. Creepy, atmospheric, emotional, heartwarming and heartbreaking, Marked in Flesh is a turning point in the story for this series. I’m so excited to see where this world and, in particular, these characters go for here. Yes! I must say I first heard about the Other series from your site and read all of three of them in one weekend. So different and amazing from what’s out right now! I downloaded Marked in the Flesh at midnight release day and finished it in 48 hours. I absolutely loved this book it was amazing. I have read it 1 time and currently listening to it for the 2nd time. Meg and Elementals are still my favorite characters in the book. I also enjoyed and laughed at the “Mother Court” with Eve. Now time to wait another damn year for last book. Out of curiosity I had a bad thought what would be your guys reaction if Anne Bishop throws a curveball in the last book. By having Meg or Simon dieing before the Meg and Simon ship reaches their climax. Like how in Divergent series where the main character dies in book 3.